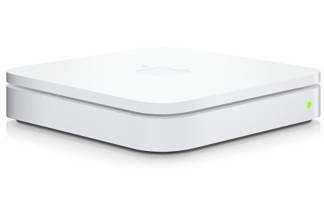 Apple’s latest refresh of the Airport Extreme adds a dual broadcasting mode that simultaneously broadcasts on both the 2.4GHz and 5.0GHz band. What does that mean? Your device should (hopefully) receive the best signal and transfer data more effecienelt. Plus, Apple has added guest WiFi accounts to the Airport which should make your neighbors and friends happy. It still allows for USB printer and HDD sharing over the network. You know you want this Airport Extreme. It’s shipping within 24 hours for $179.99.